At The Zancudo Lodge, you will experience magical ecological journeys in the Southern zone of Costa Rica. Most tours will showcase abundant varieties of wildlife, sea life, flowers and plants in its finest natural state. Come and explore the beauty of our untouched Southern Zone. Deep in the Osa Peninsula lies a vast area of rainforest developed for the sole purpose of the rehabilitation of Costa Rica’s treasured and injured critters. Macaws, toucans, sloths, white faced capuchins, mantled howlers and Central American spider monkeys are just a few of the residents who are enjoying a renewed chance of life at this Sanctuary. The Sanctuary requests that our guests refrain from wearing large jewelry pieces such as hoop earrings and fragrance due to the sensitivity of the wildlife. Includes: Roundtrip transportation from Zancudo Lodge, on site guide. Begin your morning on a scenic boat ride to Golfito with a brieftour of the past and present town of Golfito. Just a short car ride away, our guests will be transported to this botanical paradise in Rio Claro. This is a privately owned nature wonderland which contains one of the most diverse collection in the south along with numerous organic edibles and rare floral species. Guided tour with lunch. 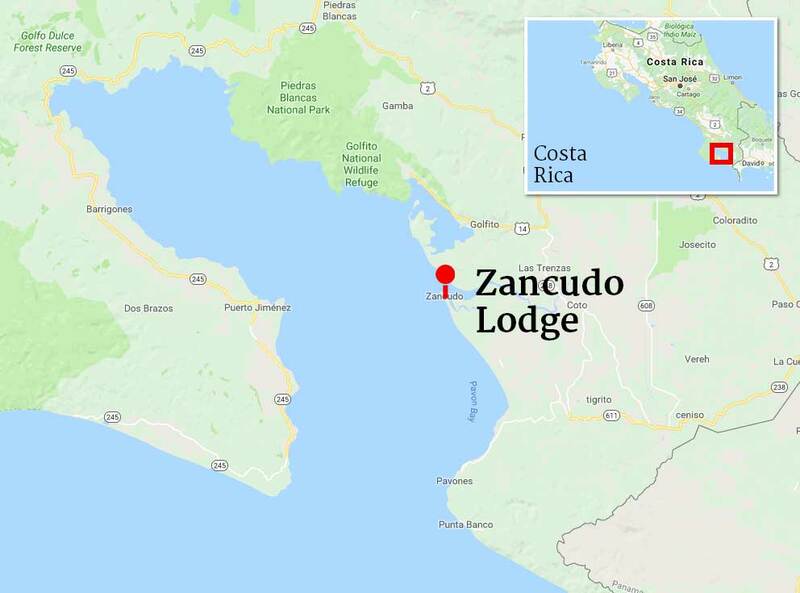 Includes: Roundtrip boat transfer from Zancudo Lodge, on site guide. Located 17km south of Puerto Jimenez, the forested Cabo Matapalo extends into the Pacific Ocean and is bordered by miles of pristine beaches. Our guests will be transported by boat to Puerto Jimenez followed by a 30 minute car ride to Matapalo. With a professional guide leading the way, horseback ride through the wild rainforest, the lowland meadow, the evergreen mountains, and the Pacific coastal rocky beaches. Guests may also have the option of experiencing an adrenaline pumping adventure of rappelling down a 100ft waterfall and/or climbing up from the inside of a strangler tree and rappelling down the outside. Includes: Roundtrip boat transportation from Zancudo Lodge, ground transportation, nature guide, snack and beverages. In this guided kayak excursion, paddle in the labyrinths of the Osa Peninsula between our protected mangroves and amazing aquatic life. Includes: Roundtrip boat transfer from Zancudo Lodge, all equipment and guide. Enjoy soothing plunge pools, soak in green vegetation and experience hiking through our rainforest! Stops are made along the way for Waterfall massages, optional Tarzan swings, Water rappelling and Cliff jumping into our natural jacuzzi. Includes: Roundtrip boat transfer from Zancudo Lodge, all ground transportation, nature guide. This is an adventurous journey above our breathtaking rainforest treetops. Located in Puerto Jimenez, your tour begins with a 20 minute drive to the virgin rainforest, continuing with a canopy ride spanning 8 platforms and 2 miles of raw Costa Rican beauty. Includes: Roundtrip boat transfer from Zancudo Lodge, all ground transportation, on site guide. Corcovado is considered the crown jewel of the Costa Rica National Park system. With 2.5% of the biodiversity of the entire planet, it is known as “the most biological intense place on earth”. This tour begins with a boat ride to Puerto Jimenez followed by an 80-minute car ride to Carate. Guests will then hike to the entrance of the Park. The hike through Corcovado traverses through the largest contiguous expanse of primary tropical rainforest north of the Amazon basin. Includes: Roundtrip boat transfer from Zancudo Lodge, all ground transportation, park entry fee, nature guide, lunch, beverages. Venture off the beaten paths and discover the array of interesting life that thrives in this young secondary rainforest. Encounter a beautiful waterfall with its rushing flow dropping into a large blue hole. Climb up rock ledges along the fall – it’s well worth the trek to more magnificent discoveries! Adventurous travelers will find some spots to jump into wild deep rock pools and wade under serine waterfalls fed by a cool mountain stream. This is a good outing option for families looking for an easy lowland walk with a lot of punch in a short distance; the bathing is divine and can be appreciated by everyone. Enjoy an hour of relaxation bliss with our Costa Rican board certified massage therapist. On property, enjoy the beautiful Osa Peninsula, right in our backyard with our own sports equipment for windsurfing, kitesurfing, standup paddle boarding, surfing and kayaking.